From credit cards to student loans, there are tons of different ways to get wrapped up in debt. Getting out of it can seem intimidating, but avoiding these common debt mistakes will help you do so as quickly and smoothly as possible. What we mean: Don’t spend beyond your means every month and depend on your credit card to make up the difference. Why: Using credit cards for everyday stuff like groceries and gas can land you reward points and even cash back. And cards are essential for things like booking a flight. But lingering credit card debt is especially nasty, because the interest, which is generally high, is added to your existing balance every day. How to avoid it: Only pull out the plastic if you’re positive you can and will pay off the balance at the end of the month. Already made this mistake? You’re not alone. Collectively, Americans owe more than $800 billion in credit card debt. The first thing to do is to stop charging and digging yourself deeper into debt. You can stop the cycle by setting up a cash budget. 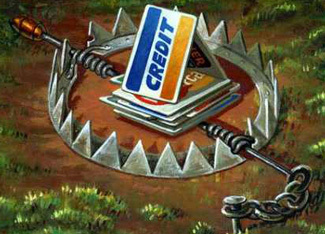 Then, pay off your cards one by one, starting with the one with the highest interest rate. Posted December 10th, 2012 & filed under Money.